Browse > Home / creativity, Featured articles, general, learning, project-based learning, teaching, technology / Look What Teachers Can Do! 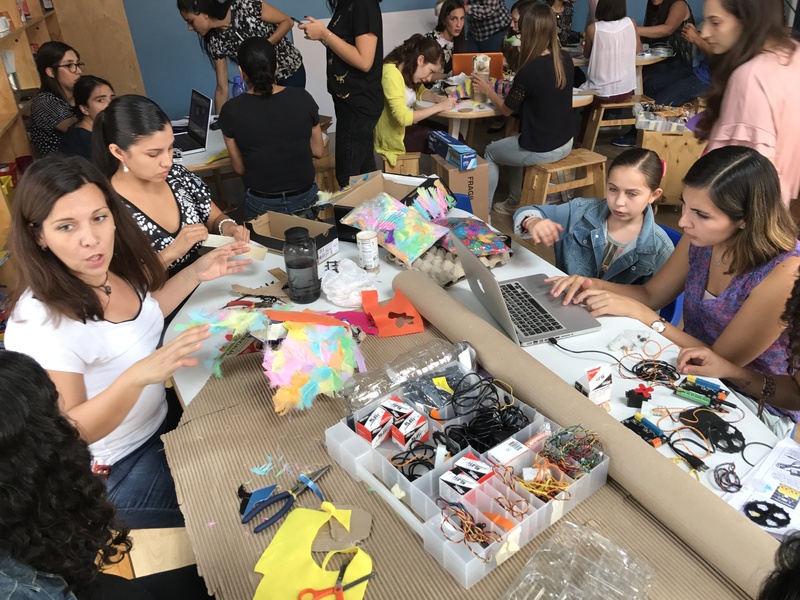 Look at what preK-6 Mexican teachers did in my recent PBL 360 workshop in Guadalajara. This was their first experience with engineering, physical computing, and programming. They designed, created, and programmed these “birds” in less than two hours with the Hummingbird Robotics Kit and SNAP! There was no instruction. The entire project was completed in under two hours – roughly the equivalent of two class periods. My work continues to demonstrate the limits of instruction, the power of construction, and the Piagetian notion that “knowledge is a consequence of experience.” There is simply no substitute for experience. Constructive technology and computing amplify human potential and expand the range, breadth, and depth of possible projects. This is critical since the project should be the smallest unit of concern for educators. Look at these short video clips sharing the teachers’ projects and compare what is possible during an educator’s first or second computing experience with the unimaginative and pedestrian “technology” professional development typically offered. We need to raise our standards substantially. The following videos are unedited clips of each group sharing their project. Start listing the plethora of curricular standards satisfied by a single project of this kind. Operatic Diva Bird from Gary Stager on Vimeo. The Parrott from Gary Stager on Vimeo. Dr. Jeckyll and Mr. Hyde Robot Pengin from Gary Stager on Vimeo. Three-Function Bird from Gary Stager on Vimeo. Singing Bird with Creepy Eyes from Gary Stager on Vimeo. Gary Stager, Ph.D. is the founder of the Constructing Modern Knowledge summer institute for educators, coauthor of Invent To Learn – Making, Tinkering, and Engineering in the Classroom, and curator of the Seymour Papert archive site, DailyPapert.com. You may learn more about him and reach out here. The Hummingbirds Robotics Kit is also available from Amazon.com.